LYRA didn’t often climb out of her bedroom window these days. She had a better way onto the roof of Jordan College: the Porter had given her a key that let her onto the roof of the Lodge Tower. He’d let her have it because he was too old to climb the steps and check the stonework and the lead, as was his duty four times a year; so she made a full report to him, and he passed it to the Bursar, and in exchange she was able to get out onto the roof whenever she wanted. When she lay down on the lead, she was invisible from everywhere except the sky. A little parapet ran all the way around the square roof, and Pantalaimon often draped his pine-marten form over the mock battlements on the corner facing south, and dozed while Lyra sat below with her back against the sun-drenched stone, studying the books she’d brought up with her. Sometimes they’d stop and watch the storks that nested on St. Michael’s Tower, just across Turl Street. 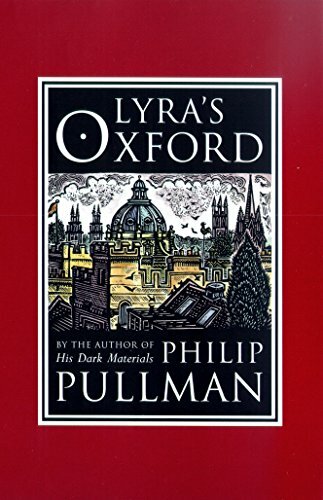 Lyra had a plan to tempt them over to Jordan, and she’d even dragged several planks of wood up to the roof and laboriously nailed them together to make a platform, just as they’d done at St. Michael’s; but it hadn’t worked. The storks were loyal to St. Michael’s, and that was that. “They wouldn’t stay for long if we kept on coming here, anyway,” said Pantalaimon. “Fish,” he guessed. “Frogs.” He was lying on top of the stone parapet, lazily grooming his red gold fur. Lyra stood up to lean on the stone beside him, her limbs full of warmth, and gazed out toward the southeast, where a dusty dark-green line of trees rose above the spires and rooftops in the early evening air. She was waiting for the starlings. That year an extraordinary number of them had come to roost in the Botanic Garden, and every evening they would rise out of the trees like smoke, and swirl and swoop and dart through the skies above the city in their thousands. “Maybe, easily. I don’t know who could ever count them. . . . There they are!” They didn’t seem like individual birds, or even individual dots of black against the blue; it was the flock itself that was the individual. It was like a single piece of cloth, cut in a very complicated way that let it swing through itself and double over and stretch and fold in three dimensions without ever tangling, turning itself inside out and elegantly waving and crossing through and falling and rising and falling again. “If it was saying something . . . ,” said Lyra. “Everything means something,” Lyra said severely. “We just have to find out how to read it.” Pantalaimon leapt across a gap in the parapet to the stone in the corner, and stood on his hind legs, balancing with his tail and gazing more intently at the vast swirling flock over the far side of the city. “What does that mean, then?” he said. She knew exactly what he was referring to. She was watching it too. Something was jarring or snagging at the smokelike, flaglike, ceaseless motion of the starlings, as if that miraculous multidimensional cloth had found itself unable to get rid of a knot. “They’re attacking something,” Lyra said, shading her eyes. And coming closer. Lyra could hear them now, too: a high-pitched angry mindless shriek. The bird at the center of the swirling anger was darting to right and left, now speeding upward, now dropping almost to the rooftops, and when it was no closer than the spire of the University Church, and before they could even see what kind of bird it was, Lyra and Pan found themselves shaking with surprise. For it wasn’t a bird, although it was bird-shaped; it was a dæmon. A witch’s dæmon. “Has anyone else seen it? Is anyone looking?” said Lyra. Pan’s black eyes swept every rooftop, every window in sight, while Lyra leaned out and looked up and down the street on one side and then darted to the other three sides to look into Jordan’s front quadrangle and along the roof as well. The citizens of Oxford were going about their daily business, and a noise of birds in the sky wasn’t interesting enough to disturb them. Just as well: because a dæmon was instantly recognizable as what he was, and to see one without his human would have caused a sensation, if not an outcry of fear and horror. “Oh, this way, this way!” Lyra said urgently, unwilling to shout, but jumping up and waving both arms; and Pan too was trying to attract the dæmon’s attention, leaping from stone to stone, flowing across the gaps and spinning around to leap back again. The birds were closer now, and Lyra could see the dæmon clearly: a dark bird about the size of a thrush, but with long arched wings and a forked tail. Whatever he’d done to anger the starlings, they were possessed by fear and rage, swooping, stabbing, tearing, trying to batter him out of the air. “This way! Here, here!” Pan cried, and Lyra flung open the trapdoor to give the dæmon a way of escape. The noise, now that the starlings were nearly overhead, was deafening, and Lyra thought that people below must be looking up to see this war in the sky. And there were so many birds, as thick as flakes in a blizzard of black snow, that Lyra, her arm across her head, lost sight of the dæmon among them. But Pan had him. As the dæmon-bird dived low toward the tower, Pan stood up on his hind legs, and then leapt up to gather the dæmon in his paws and roll with him over and over toward the trapdoor, and they fell through clumsily as Lyra struck out with her fists to left and right and then tumbled through after the two dæmons, dragging the trapdoor shut behind her.